Jerusalem, also known as the Holy City, is tucked in the Judean Mountains between the Dead Sea and the Mediterranean. This city is history, it’s culture and it’s most known for religion. There are many things to do in Jerusalem, some of which I think will surprise you. You don’t have be religious to enjoy Jerusalem sightseeing. 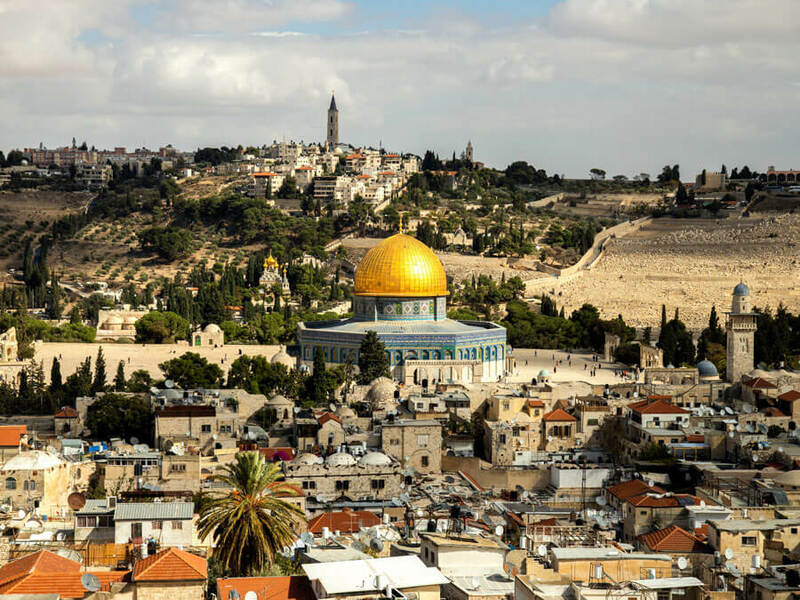 There is a modern side to the city to be enjoyed alongside the centuries worth of history and Holy sites in Jerusalem which are fascinating to see religious or not. It’s best to think of Jerusalem in layers which can be explored and learned about just by walking through the streets or joining tours. 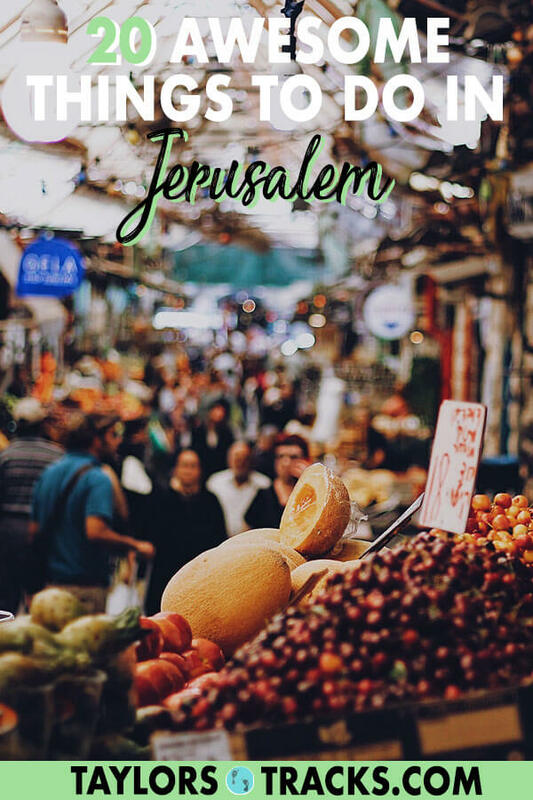 As one of the oldest cities in the world, Jerusalem is a place that won’t disappoint and is a must on any Israel itinerary. 4 Heading to Israel? You’re going to want to check out these posts. When you visit Jerusalem don’t plan to do much on Shabbat which is from sunset on Friday until sunset on Saturday. Much of the country but especially Jerusalem shuts down and many (read majority) of things will be closed and activities in Jerusalem will not be running. Dress modestly. Though this is not required in the city it’s best to be modest in the Old City out of respect and especially when entering Holy sites. Israel is expensive, budget more than you think you need. 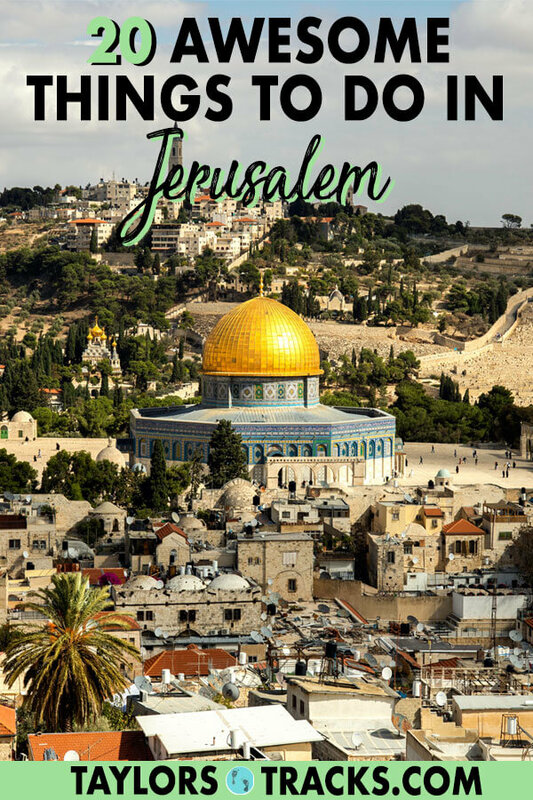 There are more places to visit in Jerusalem than just the ones on this list but this is a great place to start and covers all of the main Jerusalem attractions and more. 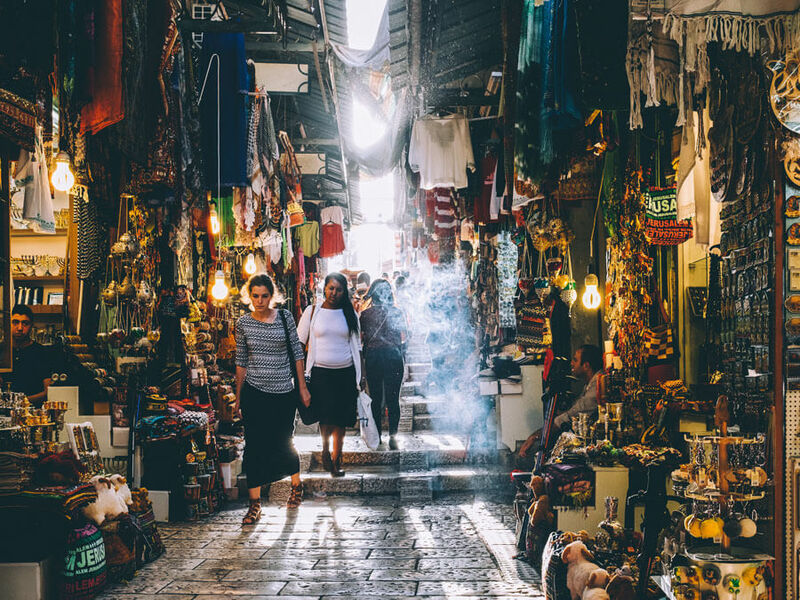 One of the most fun things to do in Jerusalem is to shop through the city’s markets. The Old City is a must-visit in Jerusalem. It is, like the name suggests, the oldest part of the city and has the majority of the main attractions which I’ll go into more detail below. Walk through the Old Town and you’re bound to stumble on a place where Jesus walked or a Holy site. For those who like to shop whether it be for new foods or for souvenirs then the Old City won’t disappoint. The colourful bazaars lining the narrow cobblestone streets are a fantastic place to get lost (it’s not difficult to) where you can find just about anything and chat with some of the locals. The Western Wall is one of the top Jerusalem sights. Religious or not, the Western Wall, otherwise known as the Wailing Wall or Kotel in Hebrew, is a site to be seen. The power of religion is evident here as it’s a pilgrimage site and a place where you can witness people of all ages praying. 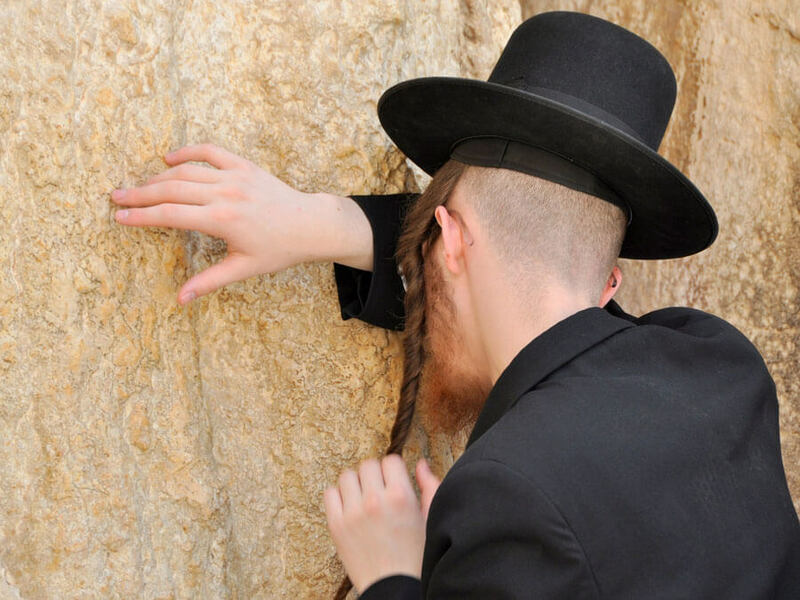 It is considered the holiest place to pray for Jews as the limestone wall is a part of the ruins of the Jewish Temple that stood 2000 years ago but was later destroyed when Jews were exiled from Jerusalem. 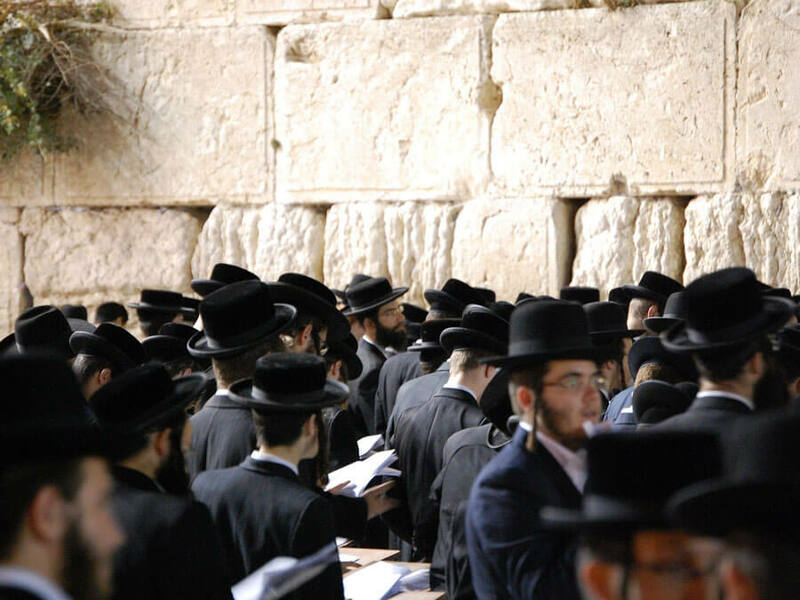 The best time to visit the Western Wall is on Friday during Shabbat when many come to pray. Keep in mind it is often busy as it is one of the top things to do in Jerusalem. One of the best places to visit in Jerusalem, Yad Vashem is the official memorial site for all of the Jews that lost their lives during the Holocaust. It acts as a reminder of the past and is a place where those can learn about the horrific events that took place. It’s a powerful place to visit so plan to stay a couple of hours. The Dome of the Rock, one of the top places to see in Jerusalem. You can’t miss these two spots in the Old City, they are easily some of the best things to do in Jerusalem. 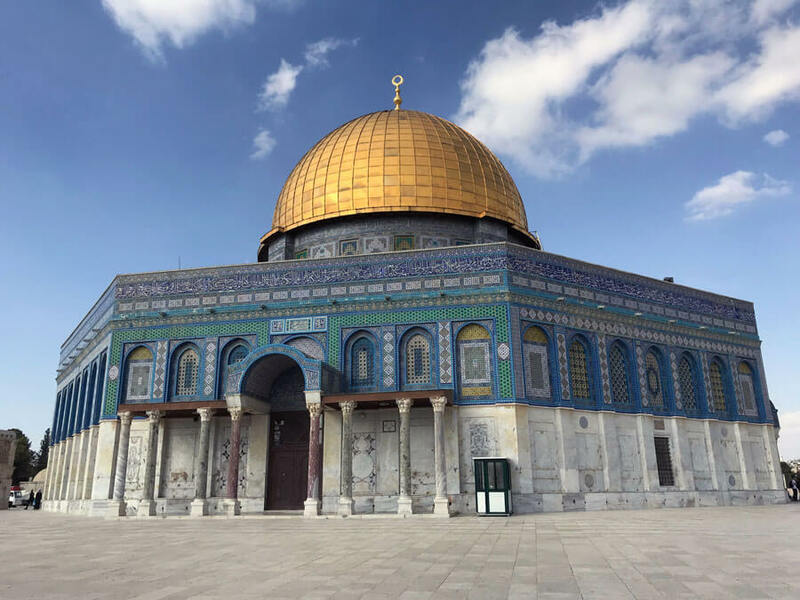 Temple Mount is the holiest place for Jews and is where the Western Wall wraps around, the third holiest site in Islam and also an important site for Christians. After the Jewish Temple was destroyed and Islam became more popular the Al Aqsa Mosque was built in 709 AD. But what really steals the show is Dome of the Rock, one of the most famous images in all of Israel that is an Islamic shrine. 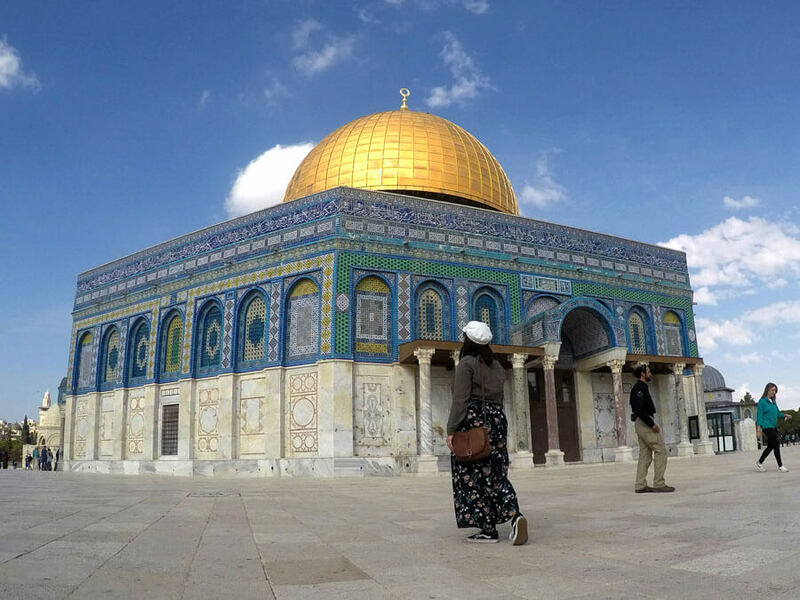 The Dome of the Rock is the oldest Islamic monument and was built in the spot that Muhammad ascended into heaven. When you visit Temple Mount dress appropriately with long sleeves, long pants or skirt and shirts that cover your chest. Clothing options can be borrowed at the entrance if you are deemed as dressing inappropriately. I highly recommend the Holy City tour. Jerusalem is an easy city to roam through and pass a lot of significant sites. There is just so much to see and quite honestly even if you have a map you will still miss out on certain spots, such as where Jesus touched a wall or miss when you’re walking from one quarter to another (there are 4 quarters in Jerusalem’s Old City: Christian, Jewish, Muslim and Armenian). This is why I would recommend doing a tour. You will see multiple of the sites I’ve mentioned in this post plus get some added history and background on the significance of each. I personally did the Holy City Tour which is in depth and I think one of the best Jerusalem tours. If you’re on a budget free walking tours are also available through Sandemans, a tour company that has walking tours all over Europe. The Israel Museum is said to be one of the best in the world so even if you aren’t a museum lover you may want to consider checking this one out. It has a huge collection of Jewish art along with some of the most known displays such as the Shrine of the Book and the Dead Sea Scrolls. 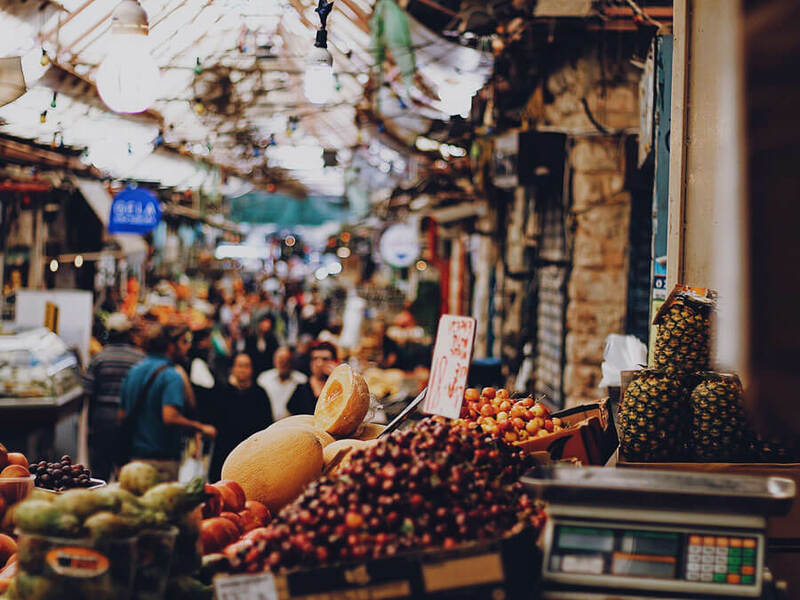 My personal favourite thing to do in Jerusalem is stop by this market! I can not encourage you guys enough to go to this market. I seriously went every night to grab fresh veggies, hummus and pita that was still warm. The amount of goodies is almost overwhelming (pro tip: try them all) and there are also plenty of bars and small restaurants to grab a seat at. Israel has expensive food so grabbing food to make for meals at Machane Yehuda Market is a great inexpensive option. There’s even a self-guided tour through the market! Or you can try the bite card which has vouchers for you to try lots of food. A pub crawl in Jerusalem? Yeah! Just because it’s known at the Holy City doesn’t mean it’s not fun. You’ll get shots of local booze too. 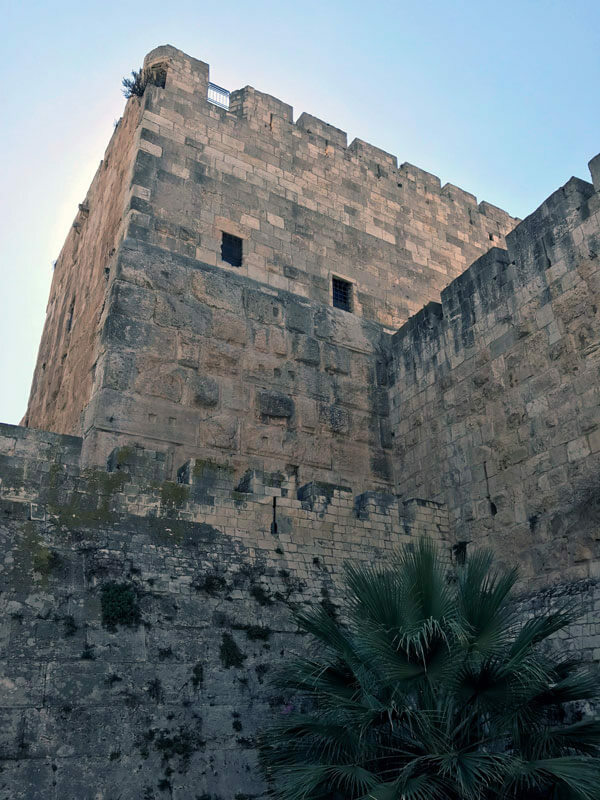 Jerusalem travel often includes a stop at the Tower of David. History is available as soon as you step through Jerusalem’s Old City gates, Jaffa Gate. The Tower of David is just to your right through Jaffa Gate and is a citadel that provides great views over Jerusalem. It’s also a museum that details Jerusalem’s history and has ancient artifacts. At night you can catch the Night Spectacular, the coolest thing to see in Jerusalem. The stone walls became screens for storytelling as images are projected onto the walls with accompanying sound. Not to be confused with the David Citadel mentioned above, the City of David is where Jerusalem was born and is just outside the Old City’s walls to the south. It’s best if you have a guide who can tell you the full story and history of this now active archeological site that includes tunnels too. 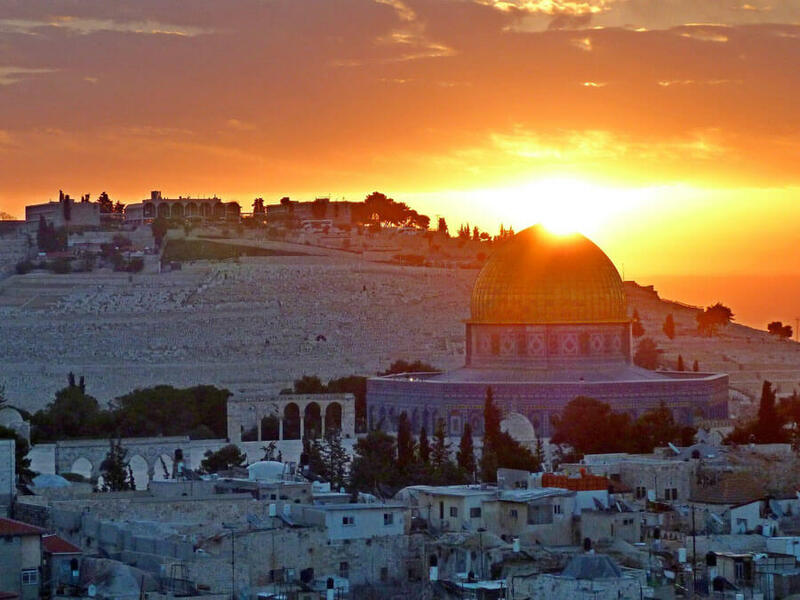 Mount of Olives is considered the centre of Jerusalem and is another great spot for views over all of the city. They’re especially great of the Old City. Mount of Olives is an important spot for both Jews and Christians who come to this site on pilgrimages. There are churches to visit as well as a graveyard where over 150,000 people were buried 3,000 years ago. 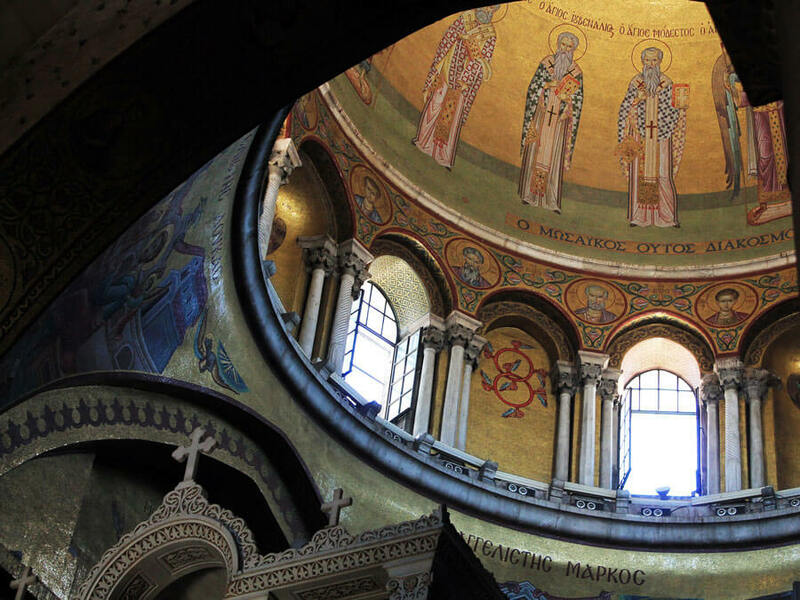 One of the most religious things to do in Jerusalem is visit this church. The most important site to Christians is the Church of the Holy Sepulchre as it’s where Jesus was crucified, buried and then resurrected. The final four stations of Via Dolorosa are also inside. The church may seem rather bland on the outside but it’s much more interesting once you step inside. What’s fascinating is that the church has different sections for each of the 5 Christian communities that make up the church: Roman Catholic, Greek Orthodox, Coptic, Syrian Orthodox and Armenian. Today they co-exist together but that was not always the case. The church is quite big and has quite a few things to see, which is why I would again recommend having a guide. If you opt to do the Holy City Tour this is one of the stops and the guide goes into quite a bit of interesting detail. Now things get a little complicated. 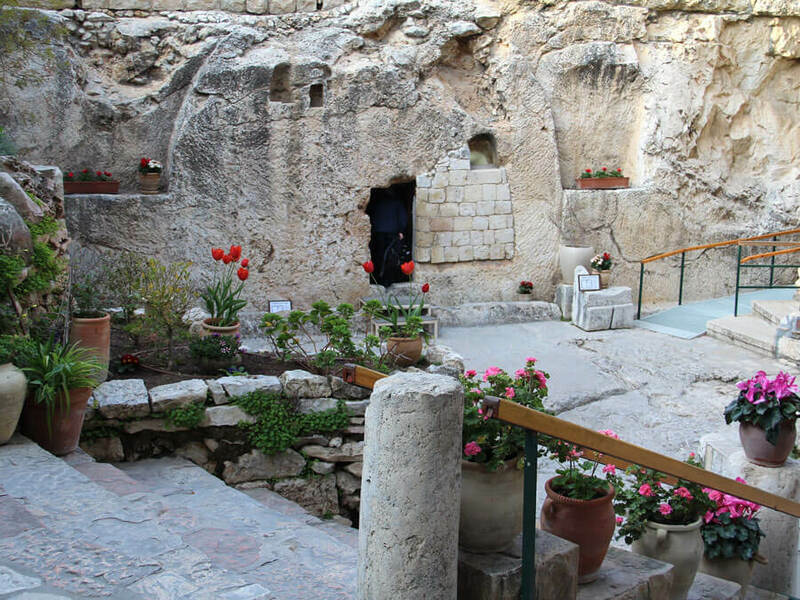 The Garden Tomb is also considered the spot where Jesus was buried and resurrected. The atmosphere here is much more peaceful than the Church of the Holy Sepulchre and is only a short walk from the Old City. The tomb is a cutout rock, was discovered in 1867 and dates back to the 8th and 7th centuries B.C. You can do the Ramparts Walk along Jerusalem’s city walk for more views of the city. The walk is only 1km and shows you just how small the city used to be. 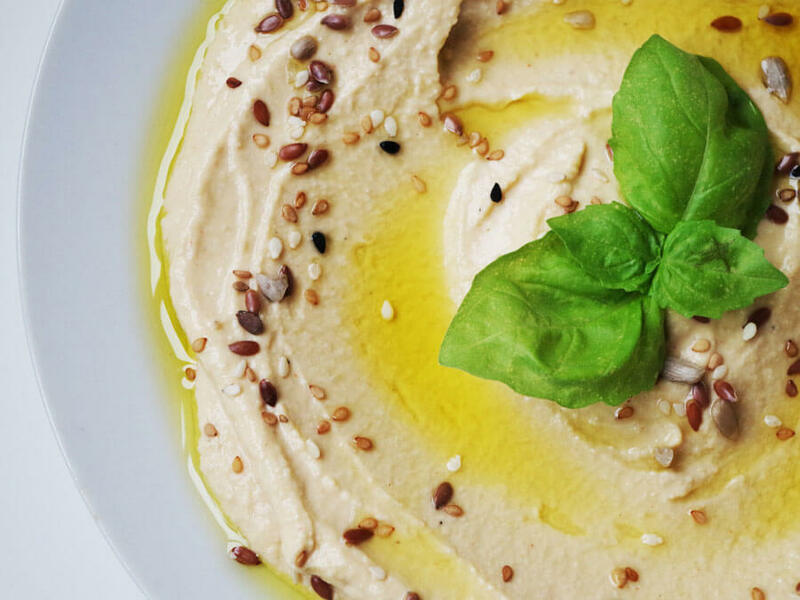 Who doesn’t want homemade hummus? If you don’t like hummus then we’re not friends. At Abraham Hostels you can join a hummus making workshop and then have dinner with your new friends. 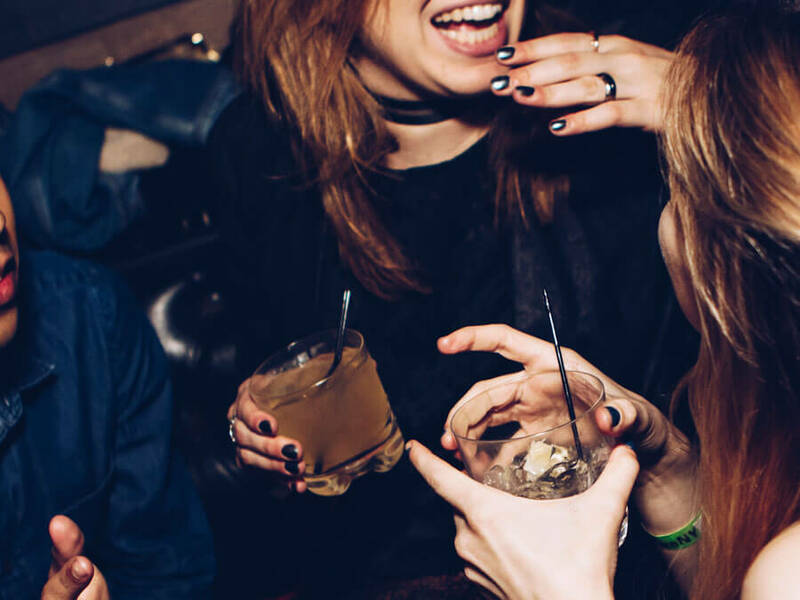 Delicious, fun and social. This is one tour I didn’t have time to do but really wish I did as it seems fascinating. 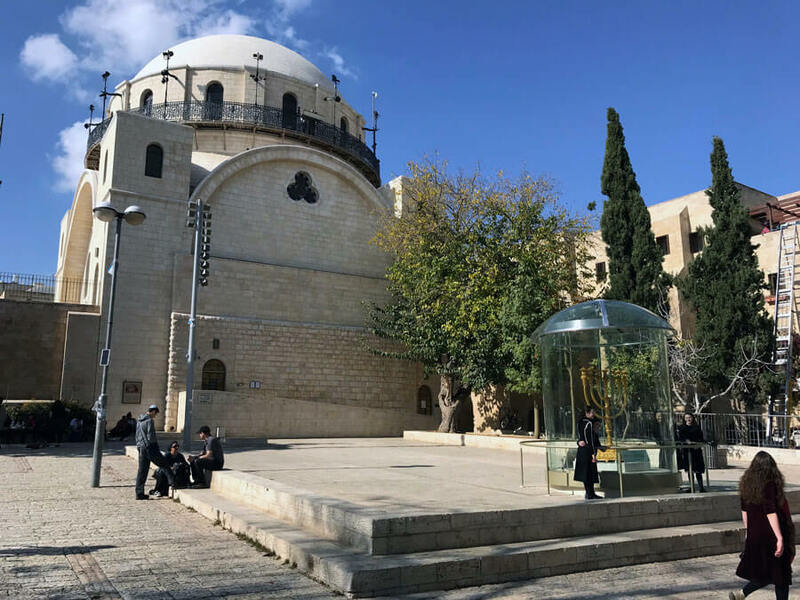 You get taken through a part of Jerusalem that is typically not visited by outsiders and have a local show you around and tell you about ultra-orthodox Jews for an insider’s perspective that is rare to get. The food is Israel is really good. 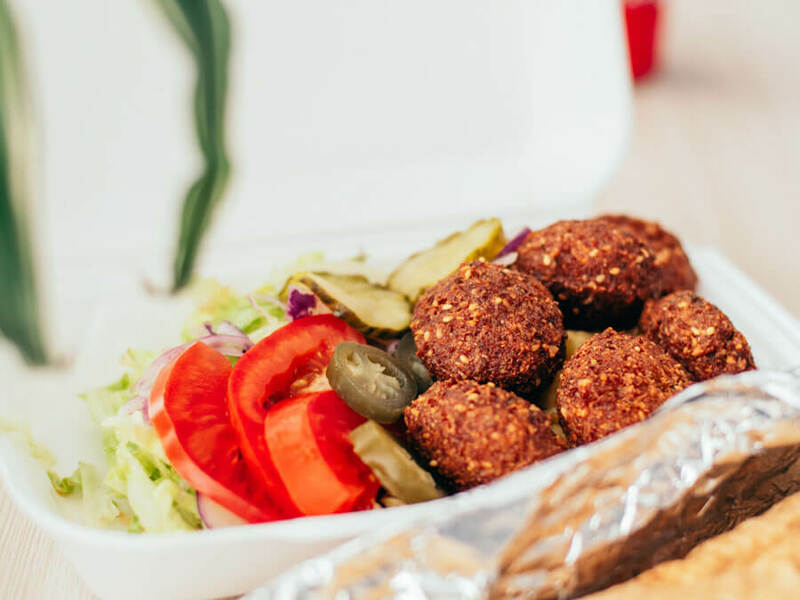 Food in Israel? Amazing, delicious, drool-worthy. So why not take a food tour? I encourage you to try vegan and vegetarian food too, you probably won’t even notice there’s no meat because the dishes are extra tasty. Spot some street not just for the cool art but to learn about Jerusalem through the art. Book Jerusalem Street Art Tour! 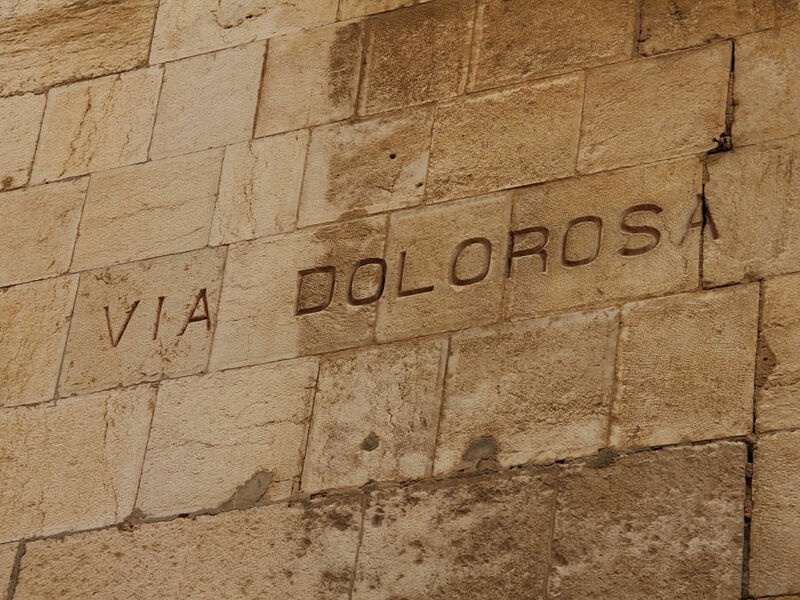 Via Dolorosa is a street in the Old City of Jerusalem that is believed to be the path that Jesus walked on his way to his crucifixion. There are 14 stops along the way, all of which are marked. The path starts at Lion’s Gate and ends at the Church of the Holy Sepulchre. Burva Synagogue is the centre of the Jewish quarter of Jerusalem. This synagogue was originally built in the early 18th century but has since been destroyed and rebuilt multiple times, the latest of which was finished in 2010. Visitors are welcome to go inside where you can find an audio tour. From the top you can find more good views of Jerusalem. Accommodation in Israel is not cheap so when looking for accommodation and making your budget keep this in mind. I personally stayed at Abraham Hotels and loved the location which was only a 20-minute walk to the Old City, right by the tram and most importantly less than a 5-minute walk to Machane Yehuda Market. Now that you know what to do in Jerusalem and what to see in Jerusalem you’re all set for a few days of packed sightseeing, enjoy! Heading to Israel? You’re going to want to check out these posts.